For centuries the land around the Susquehanna River in Pennsylvania had been the exclusive province of the Susquehannok, Delaware, Shawnee, and Muncy tribes as a hunting and trading route. By the 1700s that pattern began to change as settlers moved west from the established coastal areas in search of land. Large sections of the newly explored interior were held by powerful families - in the case of the Susquehanna district it was the Penn family who had received royal land grants in the late 1600s. Limits to the westward expansion were set by a demarcation line set by the British to avoid treaty conflicts with the Indian tribes. However the quest for land often caused this geographic line to be crossed and by the 1760s first German and then Scots-Irish began populating the area, backed by the establishment of Fort Augusta in 1756 in Northumberland. The Penn family purchased additional land from the tribes in 1768 and with the conclusion of the Revolutionary War by 1783, the limitations were essentially removed and settlement grew in earnest. An organized attempt to settle the land was made in 1762 by colonists arriving from Connecticut to establish a religious community in the nearby Wyoming Valley, but they encountered hostility and hardship, not the least of which were fierce Indian attacks. By 1774 that plan, mounted by the “Susquehanna Company” had met with dismal failure and the surviving colonists had scattered. At about the same time the Penn family began selling the lands held in the Loyalsock area to investors primarily involved in land speculation. 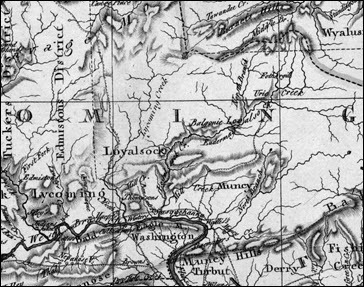 The first concerted effort to settle the immediate area began when Samuel Wallace of Muncy acquired warrants for several lots of land along the Loyalsock Creek. Following the American and French Revolutions, the political powers in England began clamping down on religious and political groups that supported these events or espoused major change. One of these groups, based in Birmingham, England, was known as the Dissenters (or Nonconformists). The nominal leader of this Birmingham group was Dr. Joseph Priestley, a renowned scientist (among his many accomplishments was the discovery of oxygen) who also was a minister. Arriving in Birmingham in 1780, he preached from a chapel, the New Meeting house, and developed a series of beliefs that many years later would form part of the basis for the Unitarian movement. His theological treatises were of increasing concern to the government, leading to the banning and burning of his 1785 work “History of the Corruptions of Christianity.” Leaders of the Church of England and Parliament were convinced that the very foundations of the Church were in danger. Later the English government amended the Test and Corporation Act and removed rights from people belonging to the Dissenters and similar groups. Priestley was one of the leading critics of the legislation which led to the burning of his home and chapel by Birmingham royalist mobs in 1791. At the time of my leaving England, my son, in conjunction with Mr Cooper and other English emigrants, had a scheme for a large settlement for the friends of liberty in general near the head of the Susquehanna in Pennsylvania. And taking it for granted that it would be carried into effect, after landing at New York I went to Philadelphia, and thence to Northumberland, a town the nearest to the proposed settlement, thinking to reside there until some progress had been made in it. He left on the ship “Samsom” from Gravesend on April 7, 1794 accompanied by many Dissenters headed for the new settlement, arriving directly at New York on June 4th. Priestly spent the eight weeks reading, and when weather permitted, lecturing to the emigrants on board. He described the passage as being marked by “mountains of ice, larger than the Captain (Smith) had seen before...the cooking was bad and the Captain swore much and was given to liquor.” Mrs. Priestley was seasick for the entire trip. Priestley was “accompanied by a vast number of emigrants of all descriptions” including some “persons of good property”, some “aristocratically inclined” and others, in steerage, “zealous Republicans.” One prominent passenger was Edward Lyon who had been a proprietor of cotton mills in Nottinghamshire. He accompanied Priestley to Northumberland, where he resided for several several years, and eventually married Ann Huckell, a daughter of fellow emigrant Thomas Huckell. From New York he left on June 18th for Philadelphia by coach arriving there on the 21st. It was a triumphal arrival for him at both NY and Philadelphia given his prominence as a scientist. He had decided to settle in Northumberland in order to re-create his pattern in England, where he lived in Birmingham and traveled often to London. At that time Philadelphia was the U.S. capital and a major seaport and was, he believed, a close approximation of his English existence. He left Philadelphia for Northumberland in July to join his sons and see the new lands set aside for his group. As it turned out, the area selected by his son was a terrible choice. The settlement was given up; but being here, and my wife and myself liking the place, I have determined to take up my residence here, though subject to many disadvantages. Philadelphia was excessively expensive, and this comparatively a cheap place; and my sons, settling in the neighborhood, will be less exposed to temptation and more likely to form habits of sobriety and industry. They will also be settled at much less expense than in or near a large town. We hope, after some time, to be joined by a few of our friends from England, that a readier communication may be opened with Philadelphia, and that the place will improve and become more eligible in other respects. Mention was made of the 1795 populace as being “survivors of the projected settlement” in a later book describing the plan. 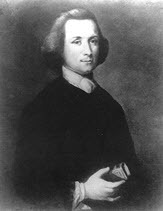 Thomas Cooper himself, who originally masterminded the plan, wrote on July 4th that "so many unthinking and unreasonable people have come that I have nearly had enough of English Society and I rejoice that those who have been disappointed have not settled here.” He also conceded “The generality of the land in this Neighborhood is not rich” in a letter to England. He was also having family problems, like many of the settlers: “(Mrs. Cooper) will not come into the woods until I get her a house built.” In the fall of that year, Cooper himself abandoned the settlement, moved to Philadelphia, went into the law profession and endeavored to buy slaves for his wife as a conciliatory action. Thomas Cooper was later appointed a judge in the state, but became the first judge in U.S. history to be impeached in 1811. Dr. Priestly found himself trapped in Northumberland as other settlers melted away. Experiments were conducted with great difficulty in the Pennsylvania frontier, and the only local church (Presbyterian) had not allowed him to preach again after hearing his first sermon. He began to lose his teeth which made his lectures somewhat less coherent than before. He wished to return to Europe - in particular France -but had exhausted his funds in getting to Northumberland. He had purchased 11 acres of land in the town for himself and decided to build a house on that spot and make the best of the situation. Sadly Harry, his favourite son, died in 1795 and his wife in 1797. Priestley died in 1804, still trying to get to France. His son Joseph stayed on still selling packages of land to keep the family financially afloat. The abrupt failure of the Susquehanna Settlement caused many settlers to leave the area. Most headed further south and settled in the Shenandoah Valley where they found a better situation in terms of farming and living conditions. In part because of its heavy settlement from Pennsylvania, the Valley has been called “a world between,” or the “third South,” part of middle America, where according to some historians there was less commitment to the Southern cause in the Civil War and even less to the institution of slavery. Historians point to the large influx of Pennsylvania religious dissenters and non-conformists who would not countenance slavery and to the distinctive agricultural practice of mixed crops they brought with them. For many of them and their descendants, carving out the religious freedom they had come for would require more work. Out of their efforts came a number of alternatives, the best known being the Unitarian Church. For the Loyalsock area settlers the flurry of excitement subsided quickly. While a few families stayed on, mostly in Northumberland, those who had seen the best of the land along the Loyalsock purchased it from Joseph Priestley Jr. and began clearing the land and farming. These were the William Molyneux, Powell Bird, the Warren, and Huckell families who began clearing the lands around Millview (current day Forksville) and Elklands (Hillsgrove). The fact that almost all of the surrounding lands still remain unpopulated is a testament to the difficulty faced by the original settlers in the area. Those families along the Loyalsock did survive however, and despite floods, droughts, endless winters and the occasional bear and cougar attacks. The small communities developed saw and woolen mills and floated timber down the creek. The names of the first settlers can be found throughout the family trees of each, as well as the names of later arrivals such as the Rogers and Littles. For many years the only way into the area was by the Pioneer Road from Muncy and part of this trail still exists and can be found in the aptly named Worlds End State Park. The material for this article was obtained from a variety of sources including Streby’s history of Sullivan County, records for Northumberland and Lycoming counties, the writings of Joseph Priestly, Sr. and the files held by the Priestley House in Northumberland, Pennsylvania. Wes Cross is a Huckell descendant who lives in Montreal, Canada where he works for McGill University. He has made but one journey to the Loyalsock, in July 2003. Huckells married into the Molyneux, Lewis, Little and Rogers families among others and descendants owned the original Huckell farm land there until 1946. He can be reached at .